Mums have it hard all of the time, especially when there’s a new arrival on the horizon or when your kids are growing up fast and want to try new hobbies and interests. In the event of either happening, it’s likely that your kids will nag you to try and make a few changes to their rooms. If so, you’ll almost certainly have to do a little DIY. I’ve been redecorating my daughter’s room over the summer holidays and have certainly been looking for a few DIY tips, as painting and so on is not really my forte. For the bathroom or kitchen, knowing how to lay tiles is essential. To make tiling easy, all you need is a set of tiles sufficient to cover the portion of wall or floor, a measuring tape and a strong adhesive for the floor on which to stick the tiles. Use the measuring tape first and then divide by the size of each tile to know for sure how many you need. Possibly the easiest DIY task to do, this is something everyone should have in their armoury. How you approach, say, painting a room depends on the size of the job. 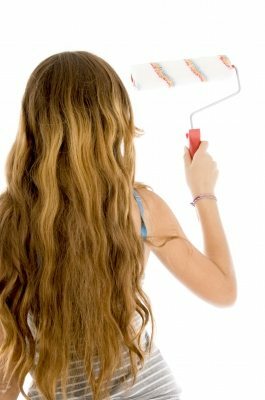 If painting a large room, the best thing to do is use a roller as it will make the job quicker and easier. For smaller rooms, use a brush for those hard-to-reach parts of the ceiling. Also, remember to apply at least two coats. A simpler alternative to painting, this can be tricky. What you need to remember when doing this is to try and keep every piece of wallpaper smooth on application after applying paste. Keeping it straight is a must too, so ask for someone, even a teenager, to help when making sure it’s at the right angle. Above all DIY can be fun, and could even become a hobby. The results can be very satisfying and you can save money too. It is always nice to be able to do a bit of DIY. You can really transform a room with a new coat of paint or tiles. You have given some great tips and links to help make your DIY a little easier. I would say that making sure you have the best tools possible is really important to make sure that you get the best result from your work. Excellent tips. It can really saves money. One of the best impression is having a good house paint in the house. Great tips and a lot of them are really important! Not only do they help to make your place look nicer they can actually raise the value of your home and in some cases they can lower your home owner’s insurance. Stuff like calking the windows and putting in safer appliances, can make your place look better and save you a buck or two!